For most tourists, shopping and food top the reasons why they love the bustling Seoul metropolitan. South Korea’s capital is best known for its shopping scene and markets that are open all day and all night. There are wholesale markets such as Dongdaemun Market and Namdaemun Market, where haggling is common and even expected. There are trendier places like Myeongdong and Hongdae that are popular among the younger and hipper crowd. Then there’s the Gwangjang Market, the oldest traditional market in Seoul with over one hundred years of history. Gwangjang Market is just like South Korea’s cuisine—bold, vibrant, colorful, and bursting with flavors. 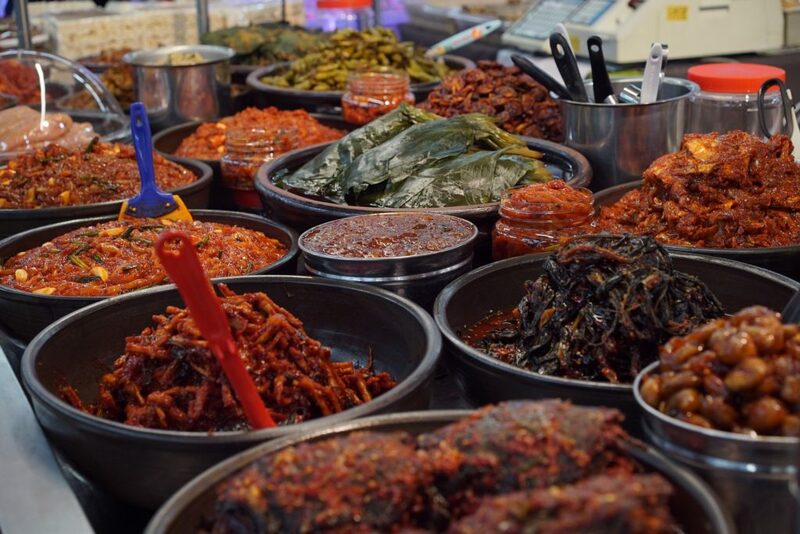 While it has everything from clothes to shoes to fresh produce, locals and foreign tourists alike flock to the market for its wide offering of traditional Korean cuisine and street food, readily available and cooked on-site. 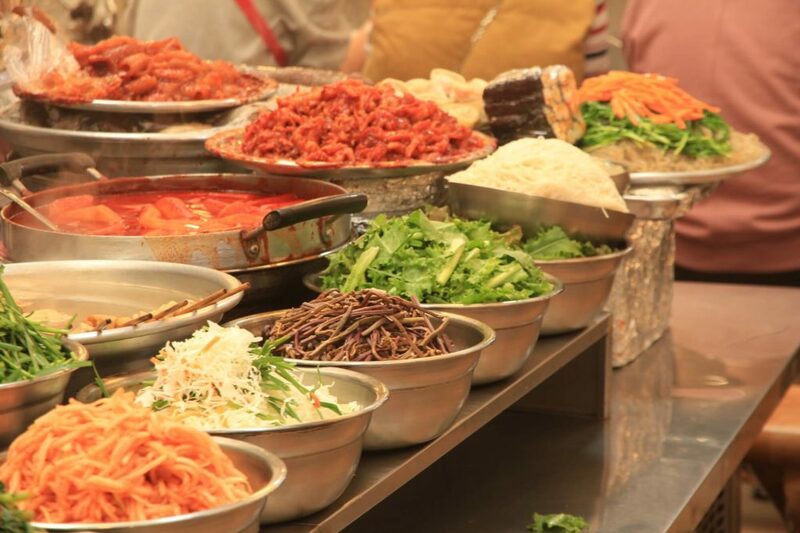 Pretty much everything you will love in Seoul can be found in this large gastronomic market. Gwangjang Market opened its doors in 1905 and survived even the Korean War. It was previously called Dongdaemun Market, but it was destroyed during the war and the building that stands today was rebuilt in 1959. It never closed its doors ever since. The 10-acre Gwangjang Market is home to 5,000 shops, with around 20,000 people working in and out of it every day. While it’s not as popular as Namdaemun or Dongdaemun, the trend of locals and tourists looking for an authentic foodie experience in Seoul gave rise to its recent popularity. Among locals, it’s still more frequented by the elderly than the youth, but there’s now a rising number of foreigners including Gwangjang Market in their travel itinerary. The rest of Seoul has transformed into a bustling, hyper-advanced metropolitan, but Gwangjang Market manages to stay true to its roots and to keep its authenticity alive. Walking into the market can be daunting at first as you’ll instantly be faced with alleyways of makeshift shops and small restaurants displaying their food out front. Piles of assorted kimchi are brandished outside the stores, as small ladies manning the restaurants are busy chopping vegetables and preparing for the next dishes they’ll serve. While every Korean delicacy you can imagine can be found here, there are some food that are especially tied to Gwangjang Market’s rich culture and history. Bindaetteok – Bindaetteok has been sold here for as long as people can remember, and this mung bean pancake is almost synonymous to Gwangjang Market itself. It’s a type of Korean pancake made from mung beans, kimchi, meat and other vegetables. Bindaetteok is usually fried in front of customers and served hot and crispy. Eomukguk – Skewered eomuk (fish cake) can be found in almost any sidewalk stalls in every street corner in Seoul. You can eat it served with anchovy stock (guk) in Gwangjang Market. While the eomuk is tasty and chewy and the soup is hot and sometimes spicy, it’s especially perfect during the colder months. Mayak kimbap – Mayakkimbap literally means drug rice roll, and it’s named as such due to its addictive quality. Kimbap is a vital part of the Korean culinary scene, and Gwangjang Market’s version are much smaller than the usual. These seaweed-wrapped rice rolls are made into bite-sized pieces that it’s near impossible to really control how much of these you’ll eat. Some say that it’s the seaweed seeds and seaweed oil that make this addicting, while others claim it’s the wasabi-mustard dip. Tteokbokki – The rich, red color of tteokokki makes it a stand out in any food stall, but its flavor also makes sure that it’s one you won’t forget. This chewy rice cake in chili sauce is often served hot and spicy. It’s a favorite snack among the locals, especially the youth. Sundae – Korea’s sundae is probably different from the sundae you know. These are actuallyblood sausages, made from steamed blood, intestines, and glass noodles. Though it may be intimidating in appearance, it’s one of the most loved street food. It can also be eaten with the tteokbokki sauce. Stalls offering sundae usually offer tteokbokki and mayak kimbap, as well. Yukhoe bibimbap – There’s an entire alley in Gwangjang Market that specializes in yukhoe or raw beef tartare, seasoned with sesame oil, sugar, salt, and soy sauce. For a more filling meal, try the yukhoe bibimbap, where the raw beef tops a bowl full of seasoned rice, kimchi, and various chopped vegetables. The market’s bibimbap is also a bit different, as they use barley rice instead of the regular one. And in some stores, the customers get to pick which vegetables to include in their bibimbap. Jokbal – For another authentic dining experience, try jokbal or pig’s feet. Preparing jokbal involves the meticulous process of removing the hair from the feet, washing it thoroughly, and boiling it till it’s tender. It’s then served sliced in a platter and with a side of fermented shrimp sauce. Sannakji – If you’re daring enough, look for a booth serving live baby octopus. Even eating sannakji can be a challenge, and the tentacles can still be moving as it slides down your throat. You’ve been cautioned. Pajeon – This tempura-like fried snack comes in multiple variations, as it can be prepared in multiple ways using various vegetables and kimchi. The most popular variation has to be the wild green onion pajeon, which can be sweet and savory at the same time. Mul naengmyeon – Cold noodles, anyone? There are two kinds of naengmyeon, and the cold variations is the one being served in Gwangjang Market. Buckwheat noodles are served in a cold broth soup with ice cubes. It may not look like it, but it can be a bit spicy. The chewy noodles can also require scissor to help diners cut through it. Makgeolli – Makgeolli is abundant in Gwangjang Market as every booth seems to serve it and for good reason. This affordable fermented rice liquor is the drink of choice among the locals, and it’s best paired with either bindaetteok or yukhoe. Hotteok – End your culinary adventure with hotteok, small, pancakes with sweet syrup as filling. It’s partly be due to its history that the market is one of the most interesting places to visit in the city, but there’s no denying that the market remains to be the best place for anyone looking for an authentic culinary experience in the Seoul. Gwangjang Market is accessible via Seoul’s subway system, and there are two stations nearby. From Line 1 Jongno 5-ga Station, go out from Exit 7 or 8 and walk south along Dongho-ro (street) before taking the first right. Walk straight till you see the Gwangjang building. From Line 2 Euljiro 4-ga Station, head out through Exit 4.